O.J. Simpson was convicted of armed robbery in 2008. His lawyers say the trial was tainted by Simpson's notorious past. Las Vegas, Nevada (CNN) -- Attorneys for disgraced gridiron great O.J. Simpson return to court Friday, arguing that the judge at his 2008 armed robbery trial in Las Vegas did not adequately guard against the looming shadow of his notorious past. Simpson's defense is seeking to reverse his conviction on 12 counts of armed robbery and related offenses in connection with a Las Vegas hotel room confrontation over sports memorabilia. The 62-year-old is serving nine to 33 years in a state prison. The Nevada Supreme Court agreed to hear his appeal but denied Simpson's request to be freed on bail while his appeals are heard. He will not attend the hearing. Simpson's Nevada conviction came exactly 13 years after a jury in Los Angeles, California, acquitted him of charges that he murdered his former wife, Nicole Brown Simpson, and her friend Ron Goldman in the biggest trial of its time. Direct references to the murder case were off-limits at the Las Vegas robbery trial, but the figurative elephant trampled into the Las Vegas courtroom as soon as opening statements began. "You will be able to write that final chapter," Assistant District Attorney Chris Owens told jurors. "The chapter of arrogance and hypocrisy, and that will be the true verdict." Simpson's attorneys, Yale Galanter and Malcolm P. LaVergne, are arguing to Nevada's Supreme Court that District Court Judge Jackie Glass "gave no deference to the fact that Simpson brought a lot of baggage into the courtroom," did not permit thorough questioning of prospective jurors and should not have allowed prosecutors to dismiss the only two potential African-American members of the panel, leaving an all-white jury to deliver the verdicts on October 3, 2008. Glass then erred when instructing the jury on the intent required for some of the charges, the attorneys argue in their court papers. The attorneys also claim that Glass scolded the defense lawyers inappropriately in front of the jury. Miami, Florida-based Galanter appeared to have an especially contentious relationship with Glass, with the judge often admonishing him, "Stop, stop, stop!" and "Sit down!" In his response filed with the Supreme Court, Clark County District Attorney David Roger argues that the legal rulings during trial were correct and that Glass remained "professional and neutral" in spite of unprofessional behavior by the defense. "The district court is not at fault for refusing to succumb to the intimidation of veteran attorneys," the prosecutor wrote in his court papers. 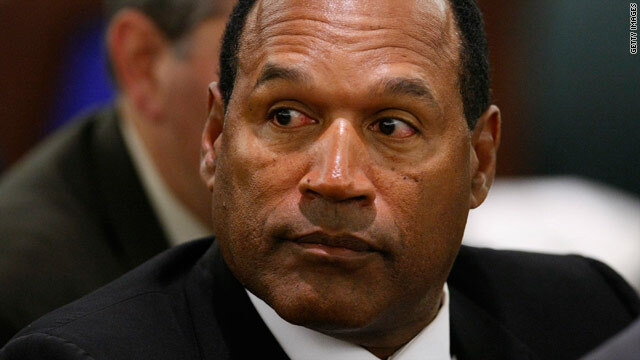 During the trial, prosecutors alleged that Simpson had shuttled his sports and personal memorabilia to friends before California authorities descended on his home to seize assets as part of the $33.5 million judgment awarded to the families of Brown and Goldman, who won a wrongful-death verdict in 1997. According to testimony at his trial, Simpson arranged the heist at Palace Station Hotel and Casino after getting word that football trophies, photographs and other items that he claimed belonged to him were being sold by a sports memorabilia dealer. During the three-week trial, jurors heard an audio recording of the a confrontation captured by a hidden digital recorder. "Don't let nobody out of this room," Simpson is heard saying on the profanity-riddled recording. "Think you can steal my s**t and sell it?" The digital recorder, which sat undetected on an armoire as the room was processed by law enforcement, also captured the banter of Las Vegas investigators about the controversial murder verdict. "This is great. California didn't get it done; now we'll get it done," one crime scene analyst says, according to a transcription. Of the five men who accompanied Simpson to Palace Station, four pleaded guilty to reduced charges in exchange for their testimony at trial, leaving only Clarence "C.J." Stewart to face a jury verdict alongside Simpson. Stewart's defense team argued that their client should be given a separate trial, suggesting that the connection to Simpson would be detrimental. Stewart was convicted along with Simpson and is serving seven to 27 years. He also is appealing. Attorney Brent Bryson's argument on behalf of Stewart will be heard by the three-justice panel after Simpson's Friday morning, and his focus will once again be that the men should not have been tried together because of the "spillover effect" of Simpson's case. "O.J. is a creature created by his own actions, and he has to live with that," Bryson told In Session. "The persona he's created, that the media has created, he's stuck with, but that doesn't mean my client should be stuck. That's exactly why the law allows for severance."